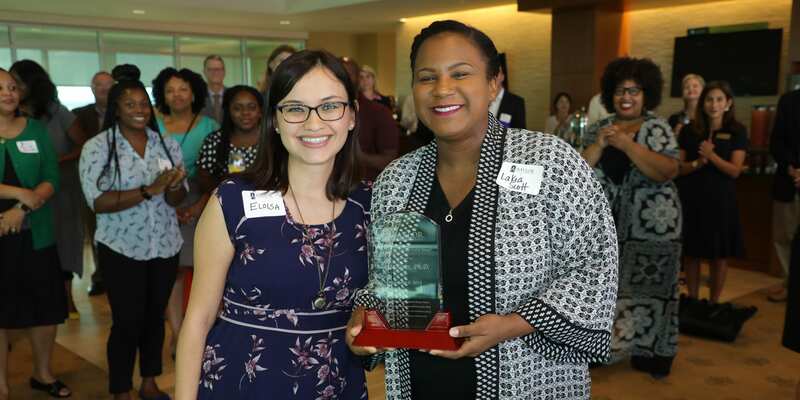 Dr. Lakia Scott (right) receives the Baylor Diversity Enhancement Award from Eloisa Haynes, chair of the Campus Diversity Committee. 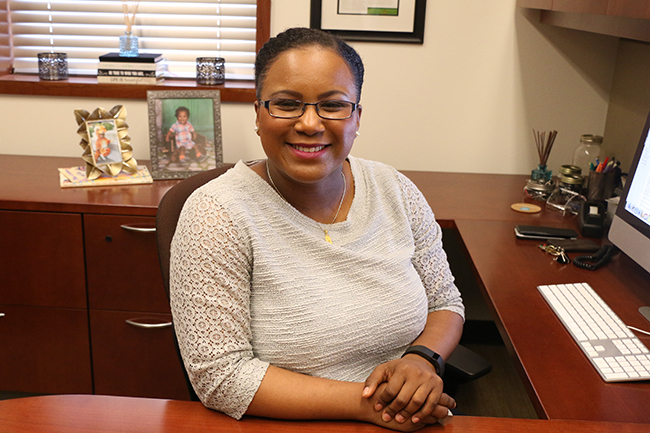 Dr. Lakia Scott, assistant professor in the School of Education’s Department of Curriculum & Instruction, received the 2018 Baylor Diversity Enhancement Award, presented at a reception in the President’s Suite of McLane Stadium on Sept. 6. After a week with students and teachers in Ghana at Kyerekrom Roman Catholic Primary School, Assistant Professor in Curriculum & Instruction Lakia Scott, Ph.D., and Baylor senior Branda Greening knew two things: they longed to return the following year and they wanted to write a children’s book. 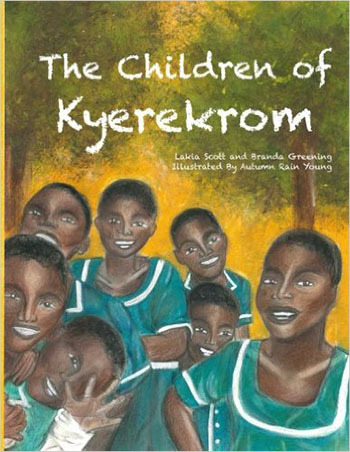 The book, The Children of Kyerekrom, is available now on Amazon and will raise money for the school. For the second year, Baylor School of Education (SOE) dean, Dr. Michael McLendon, chaired the Graduate Student Policy Seminar for the Association for the Study of Higher Education (ASHE) annual conference, held in November. The seminar invites, through a competitive process, 50 advanced doctoral students from leading universities for a two-day pre-conference series of discussions, addresses and workshops around issues pertaining to public policy and higher education. After years of research and first-hand teaching experience with literacy in American public schools, two Baylor professors decided change was imperative. 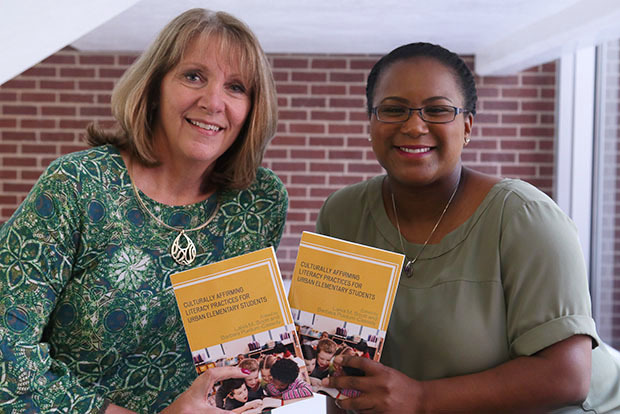 Assistant professors of curriculum and instruction in Baylor’s School of Education, Lakia Scott, PhD, and Barbara Purdum-Cassidy, EdD, compiled and edited “Culturally Affirming Literacy Practices for Urban Elementary Students,” a textbook about literacy gaps for pre-service and in-service teachers. A pilot program sponsored by Baylor School of Education’s Department of Curriculum & Instruction aims to impact math understanding in pre-kindergarten children in Waco. During July, the School of Education is conducting a pilot program in early math intervention, the Math for Early Learners Academy (MELA). 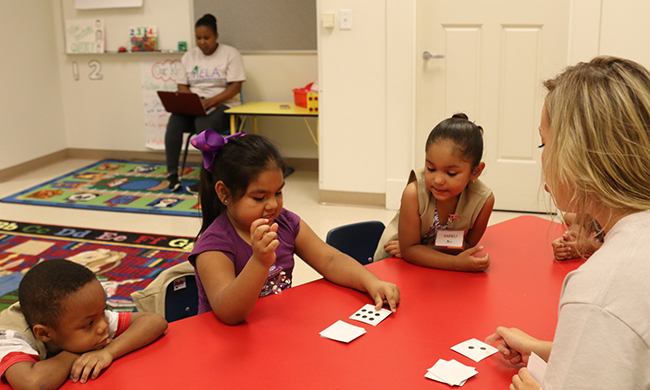 The brainchild of Dr. Sandi Cooper, professor in math education, the four-week camp targets 4-5 year olds who are entering kindergarten and need help building number sense, based on assessments. If you asked Baylor University senior Branda Greening a year ago about her vision for education and her plan for the future, she might have said education was the “window of opportunity” and her life plans were determined. When asked those questions now, Greening’s response is drastically different. 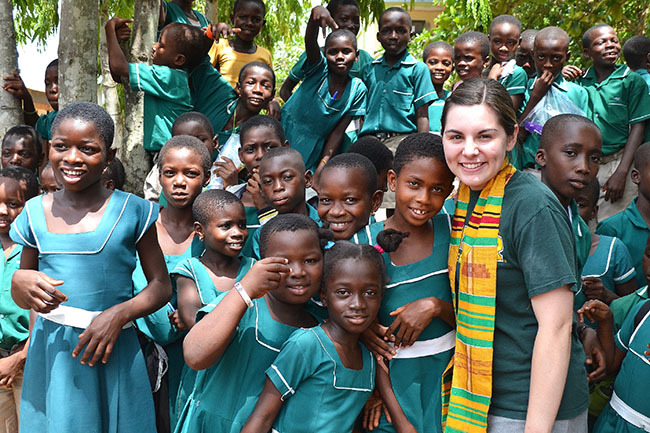 In the fall of Greening’s junior year, her education professor, Dr. Lakia Scott, invited Greening on Baylor Missions’ annual Ghana Leadership mission trip. In May 2016, Scott and Greening embarked on a trip that challenged their views of education. “I had my life figured out until I came here,” Greening said of the Ghana trip. While she still plans to become a teacher, Greening’s passion has expanded. Several Baylor School of Education faculty members presented research at the annual meeting of the American Educational Research Association (AERA), held in Washington, D.C., April 8-12. AERA is a national research society that is concerned with improving the educational process by encouraging scholarly inquiry related to education and evaluation and by promoting the dissemination and practical application of research results. Its more than 25,000 members include faculty, researchers, graduate students, and other distinguished professionals with expertise in education research. Could Historically Black Colleges and Universities (HBCUs) be a thing of the past? Funding and Black student enrollment at HBCUs have decreased, and there are few signs that this trend will reverse anytime soon. Dr. Lakia Scott, assistant professor of curriculum and instruction in Baylor School of Education and a two-time HBCU alumna, believes HBCUs are still relevant and should be preserved. 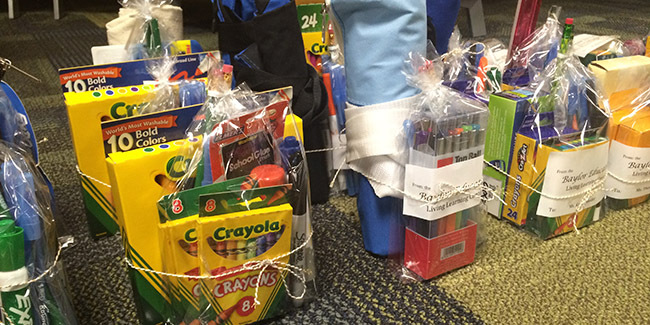 The Education LLC service committee launched its first semester with a school supply drive. If “greatness is determined by service,” as the late Dr. Martin Luther King Jr. said, then the Baylor Education Living Learning Center (LLC) service committee is on the fast track to greatness. The young team of six residents held four service events during its inaugural semester, reaching out to the Waco community. 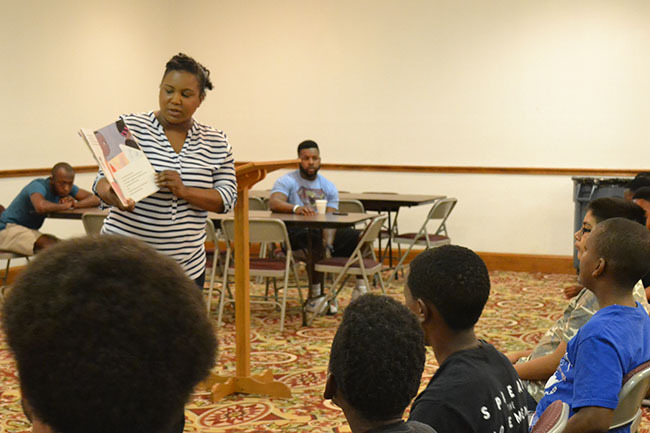 A summer sabbatical studying local and statewide trends in urban literacy sparked a new goal for Dr. Lakia Scott. 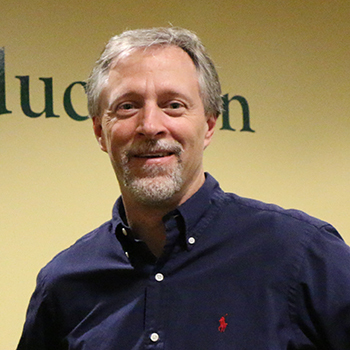 As an assistant professor in the Baylor School of Education, Scott set out to examine program models that could benefit Texas elementary students who struggle in reading achievement.